This song is best known by it appearance in The Jazz Singer, the first “talking picture” that revolutionized Hollywood filmmaking overnight. “Toot, Toot Tootsie” was sung by Al Jolson, playing the role of a young jazz singer known as Jack Robin nee Jakie Rabinowitz. 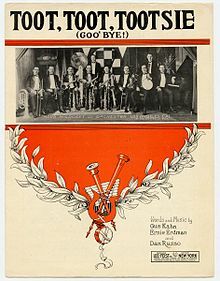 “Toot, Toot, Tootsie Goodbye” was recorded on April 5, 1961 and released in 1961 on the album My Heart Sings. It was arranged by Ralph Burns. “Toot, Toot, Tootsie” was recorded live at Tony Bennett’s concert at Carnegie Hall on June 9, 1962, but was not released until 1997 on the album Tony Bennett at Carnegie Hall: Complete Concert. Ralph Sharon arranged the song.